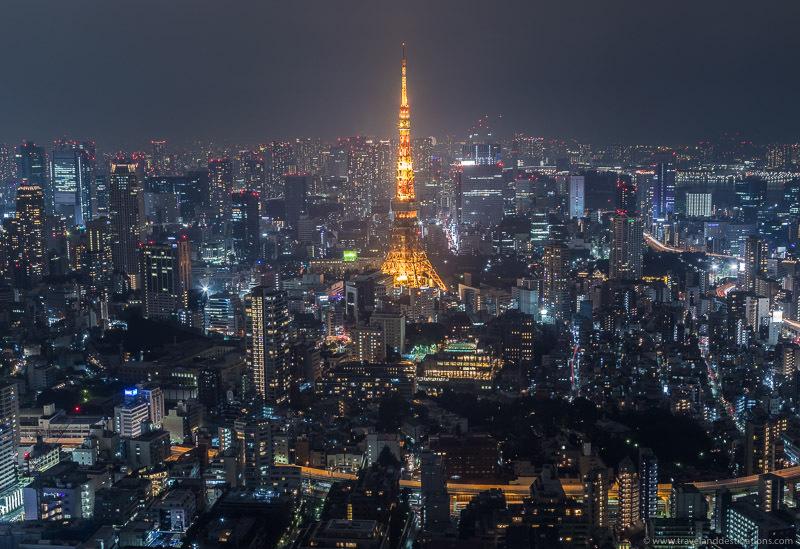 Bright lights, colourful billboards and a bustling nightlife, Japan’s cities at night are some of the most energetic and interesting places to visit. 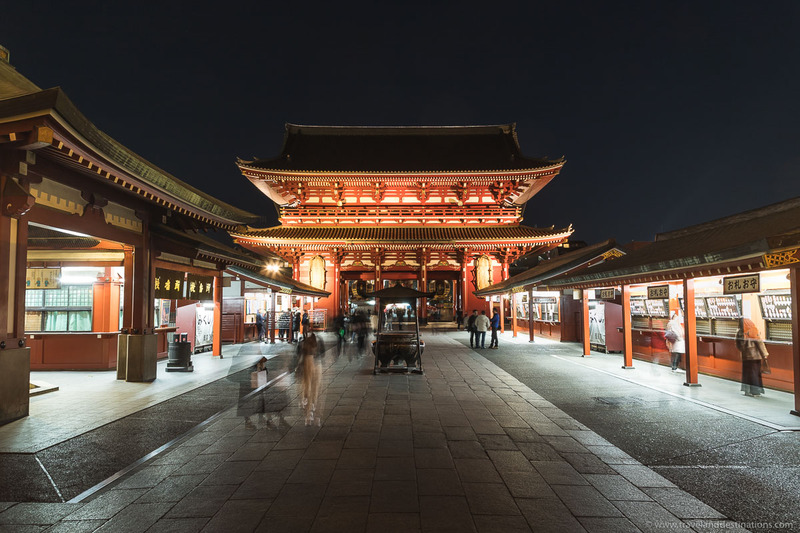 Below are night photographs from various cities in Japan to give you inspiration for your next trip. 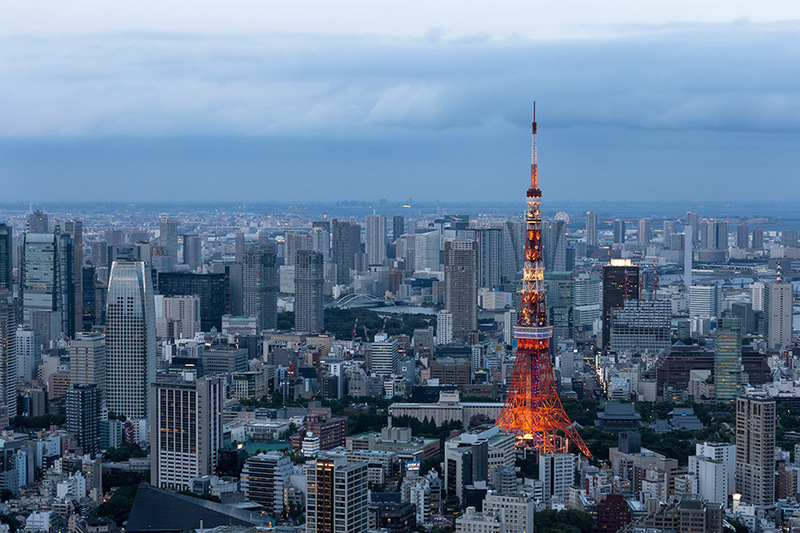 Tokyo serves as a popular entry point into Japan, being the capital and also due to its large number of international connection. 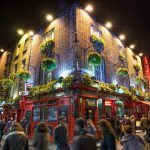 It’s an awesome city to explore at night, full of picture opportunities and things going on all around. 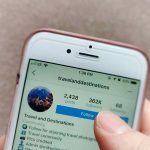 When visiting Tokyo and exploring at night then check out a few of the spots mentioned below. Tokyo is fast, with lots going on in all directions. This makes it exciting and there’s nothing better than just diving straight in and embracing the city. 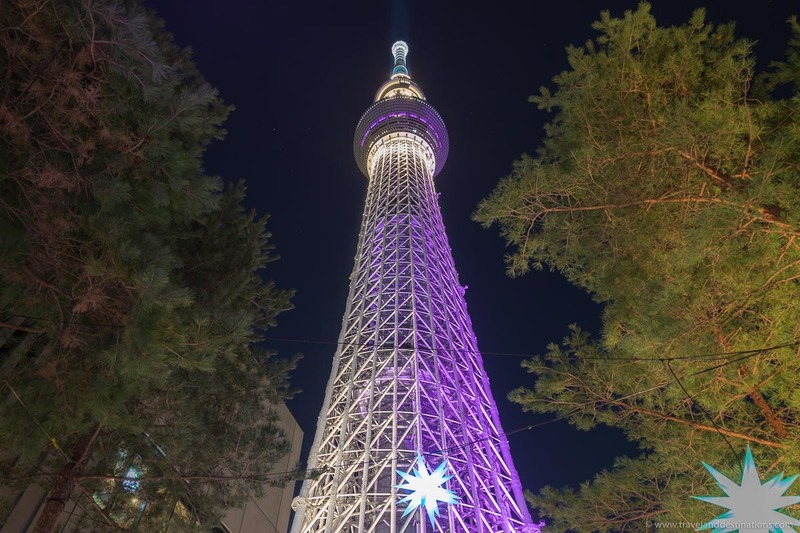 For some of the most epic views of Tokyo, the Tokyo Skytree is a must visit. The observation decks present you with sweeping 360 views and allow you to appreciate just how vast the city is. 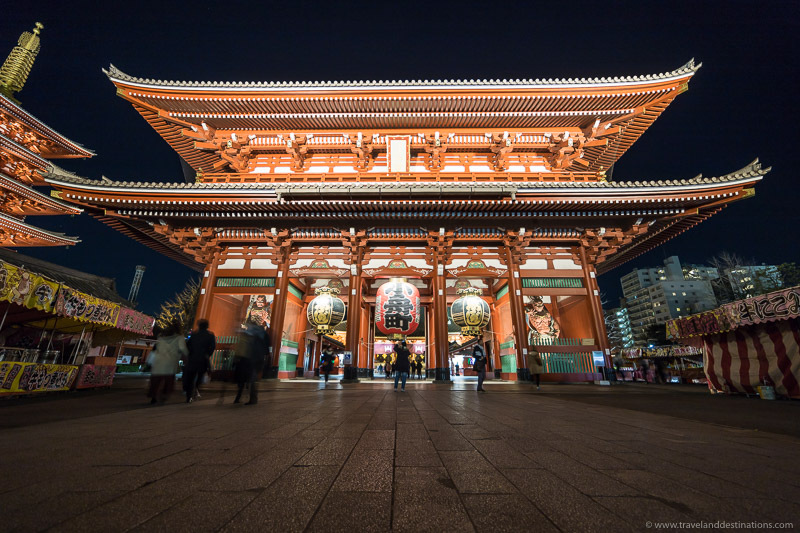 Not far from the Tokyo Skytree is the Sensoji temple which is one of the city’s most famous and popular landmarks. Also is a beautiful 5 story pagoda, the Hozomon Gate as well as the Kaminarimon Gate. All of these are fantastic to see and photograph, especially at night when it’s quieter. 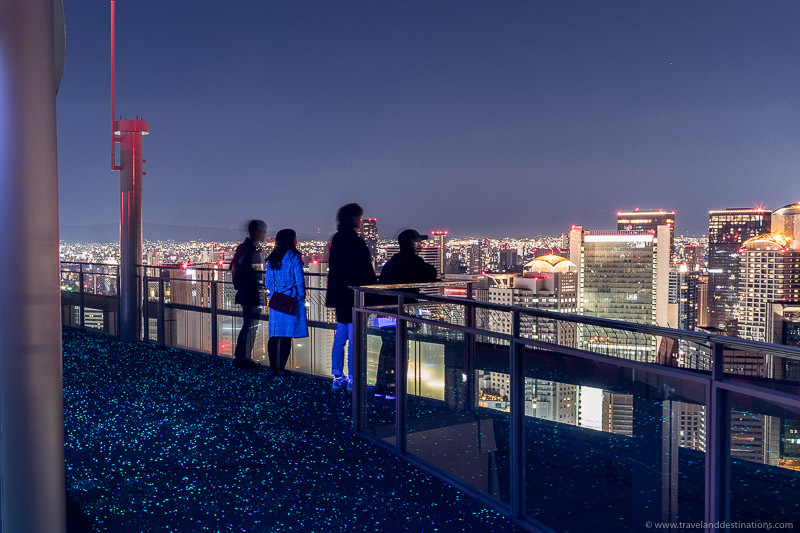 Another great spot for skyline views is from The Tokyo City View. This is located in the Roppongi Hills Mori Tower and is where you can get the classic view of the Tokyo Tower. There is both an indoor observation deck, as well as a sky deck. One good thing about taking photographs inside is that the lighting is low, meaning you get fewer reflections from the glass. 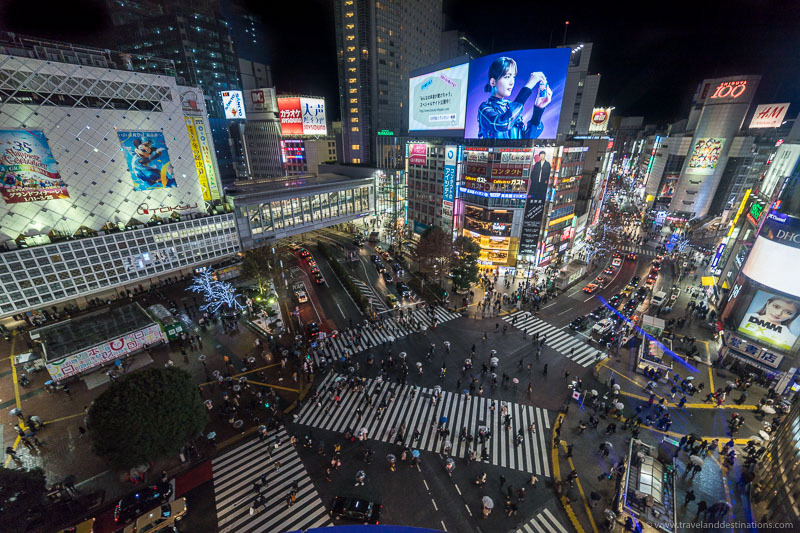 The main entertainment district and a great experience is Shinjuku. 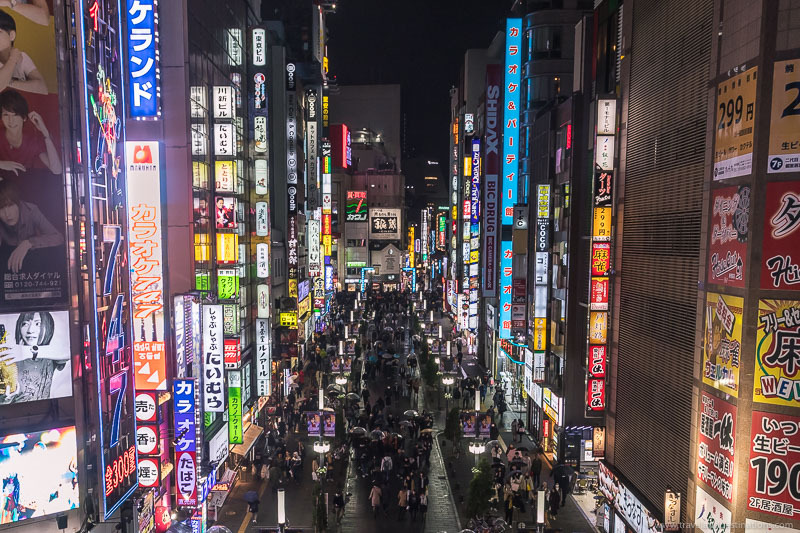 Here you’ll find more billboards and neon lights than you’ve probably ever seen and this area can really help you get a taste of Tokyo nightlife. Also in Shinjuku and not far from the main station is the very pretty Memory Lane. This street is full of small food stands where you could just rock up, sit with the locals and grab a tasty bite. Shibuya Crossing is one of the busiest crossings in the world and a great spot to relax and watch the constant flow of people and traffic. It’s also fun to cross and oddly feels busier at ground level. 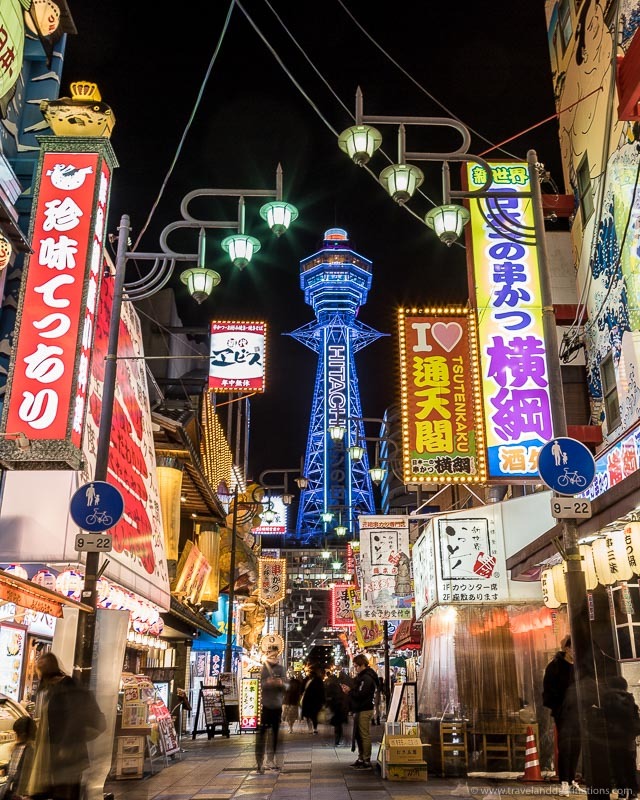 Another top city to visit in Japan, especially to experience Japan’s nightlife is Osaka. 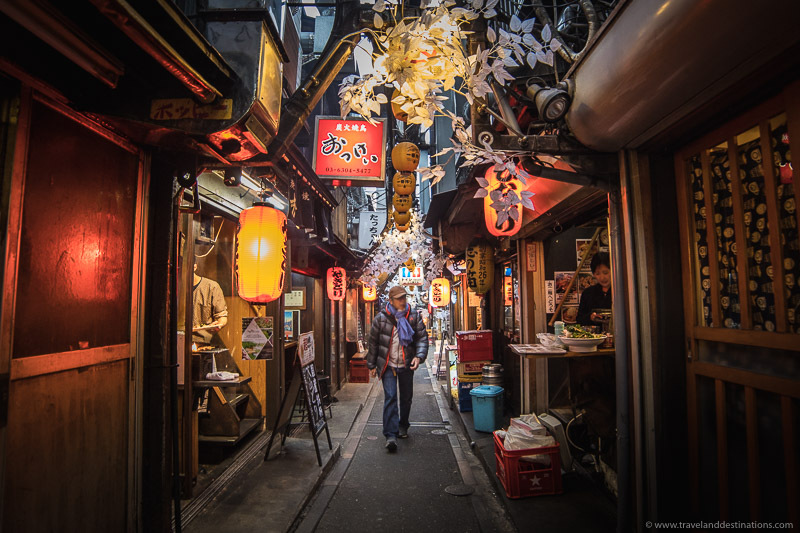 Similar to Tokyo it has some super cool spots to explore and those being full of awesome lights, bright colourful billboards and intriguing shop fronts. 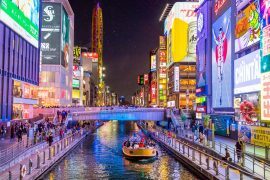 Head along the Dotonbori canal where you can enjoy an entertaining boat ride with colourful scenes all around. A highlight of the Dotonbori canal is the Gurikoman billboard seen below on the right (the running man) which signifies an image of health and is made up of around 14 million LEDs. Often tourists and locals alike will be doing the same pose for a photo with the billboard behind them. Around the Osaka you may find several cute streets such as below. Lining these are restaurants serving delicious and mouthwatering dishes. Osaka has a cool tower, Tsutenkaku, designed by the same architect who designed the Tokyo Tower. The 103 meter structure has an observation deck, or you can enjoy from ground level (like below). 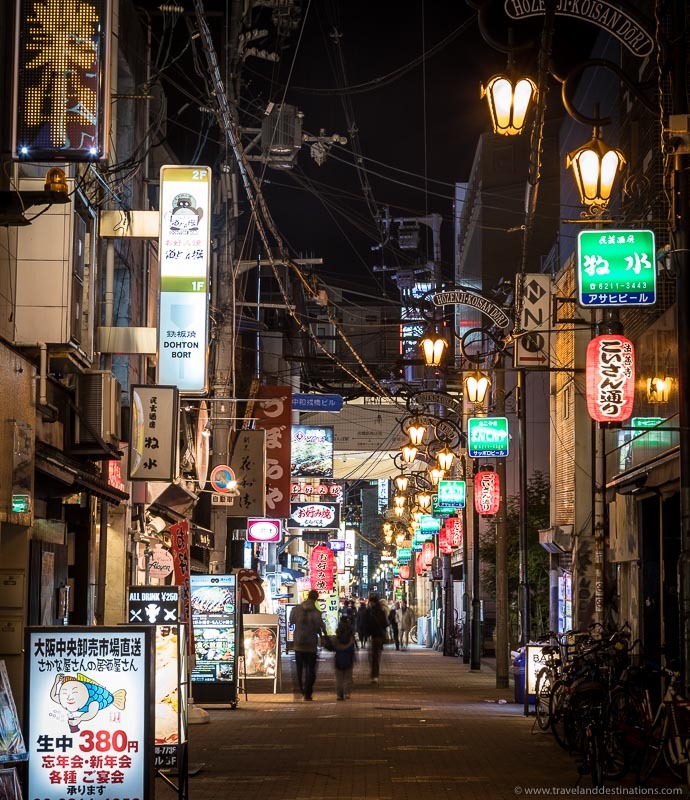 Also in this area are lots of nice restaurants where you can get Kushikatsu, a delicious fried treat that’s also great for sharing with friends. When visiting Osaka an unmissable landmark is Osaka Castle. 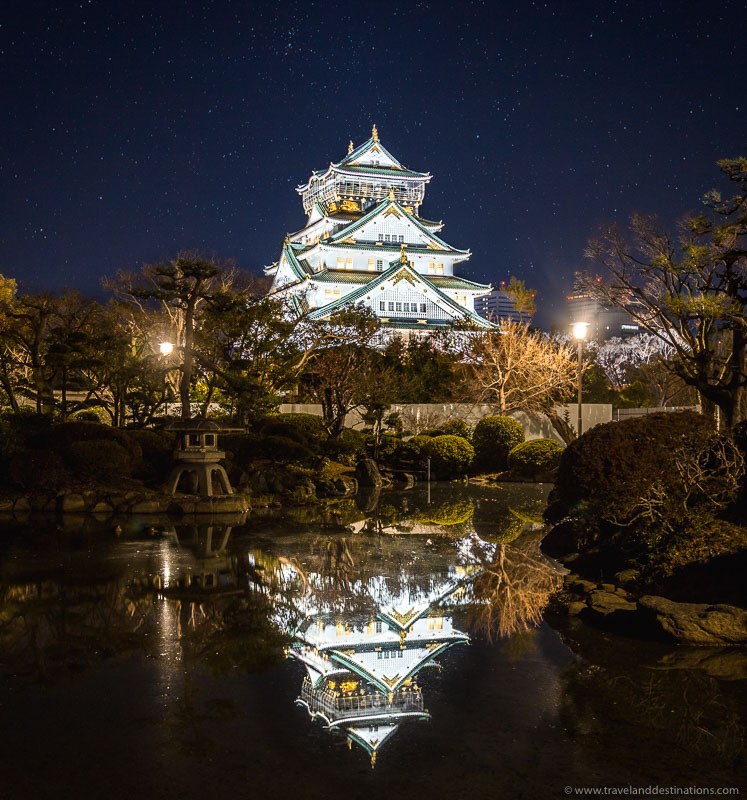 This beautiful castle is loved by the Osaka people who helped donate to fund it being rebuilt. When exploring at night the grounds make for a peaceful and romantic walk. The Umeda Sky Building’s observation deck serves as a top place to see the city. Visit at night, soak in the skyline and relax whilst listening to the peaceful music which adds to the ambience. Also, a nice spot for couples to enjoy. 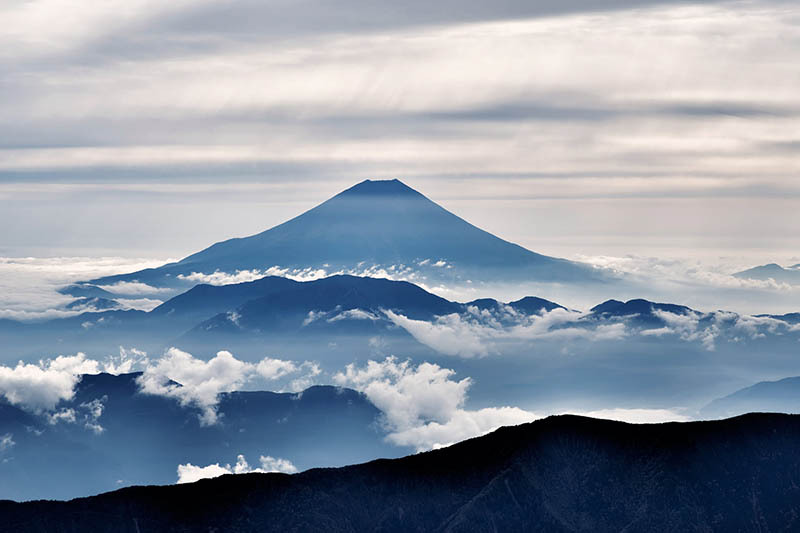 Kyoto used to be the capital of Japan until 1868 and has some of the country’s top and must-see attractions. And, as well as plenty to do during the day, it has plenty of beautiful spots to explore at night. 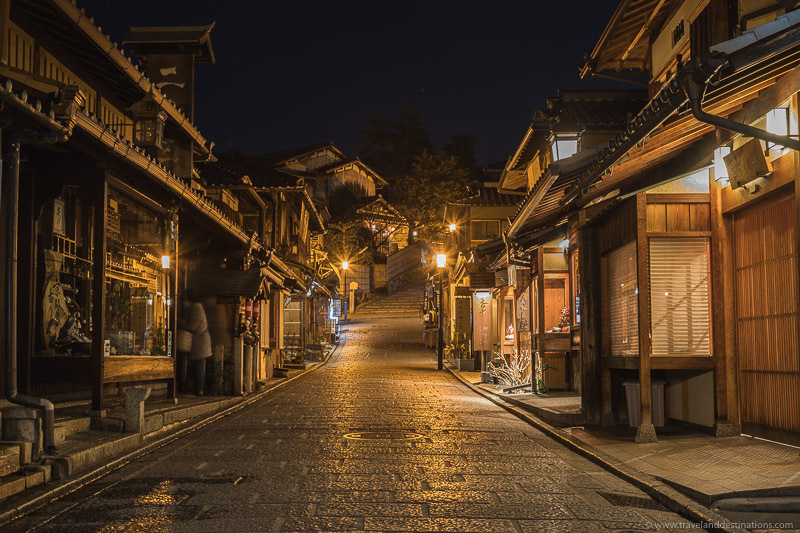 The streets of Ninenzaka are lined with classic traditional Japanese architecture and as these streets get quite busy during the day, visit at night for some calm peaceful walks. Also in the Ninenzaka area is the Hōkanji Temple (Yasaka-no-Tou), a five-story pagoda often seen in postcards. When visiting at night you may have this classic spot all to yourself. Do you like heights and want skyline views of the city? 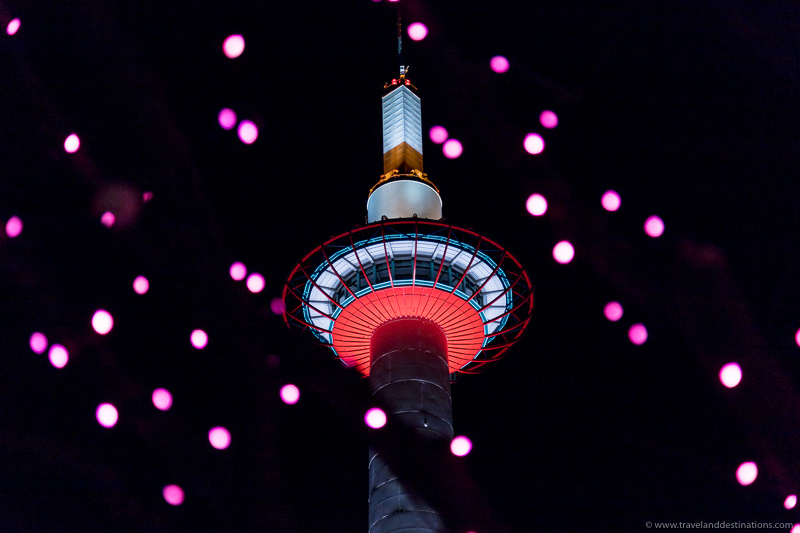 Then head up Kyoto Tower. Located near the main Kyoto station, visit this spot to watch the sun go down and into the blue hour before continuing your night. 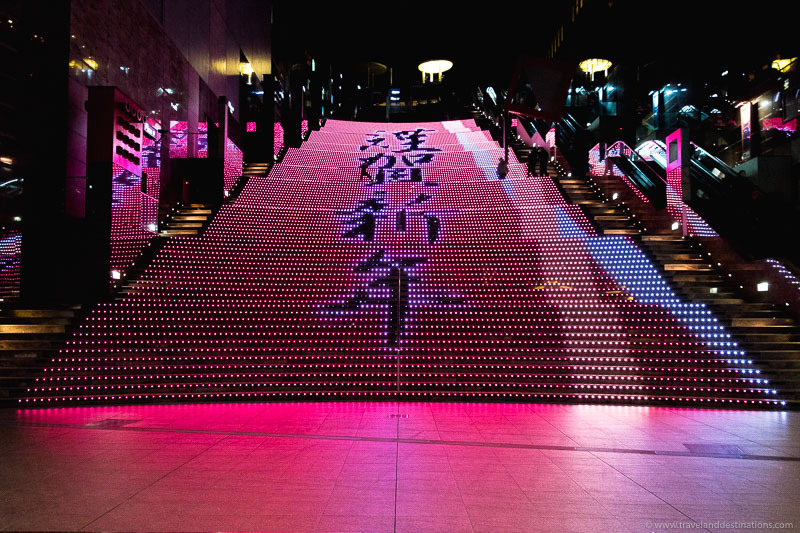 Kyoto Station has a special illumination located on one of their stairwells. These LEDs change throughout the year based on the season and are accompanied by really nice music. Check out this spot when staying in Kyoto and passing through the station. Use reflections such as in water features or puddles for a unique photo. 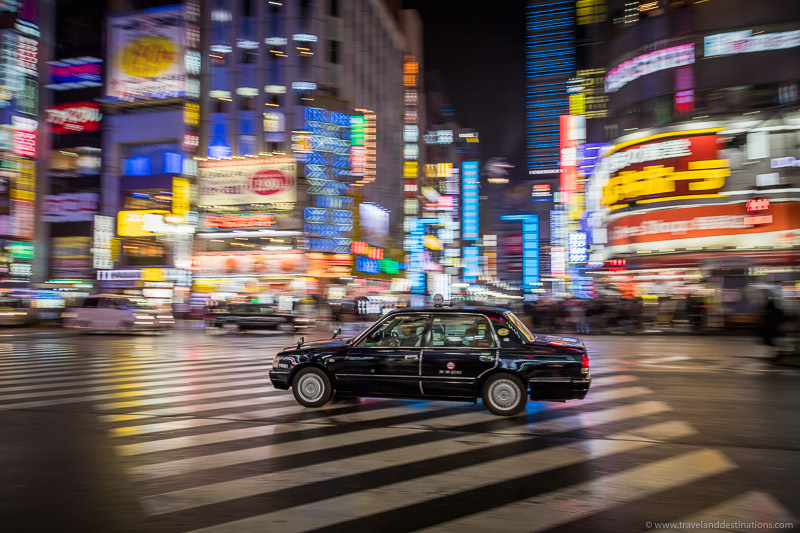 Hey Buddy!, I found this information for you: "In Pictures – Japan – Cities at Night". 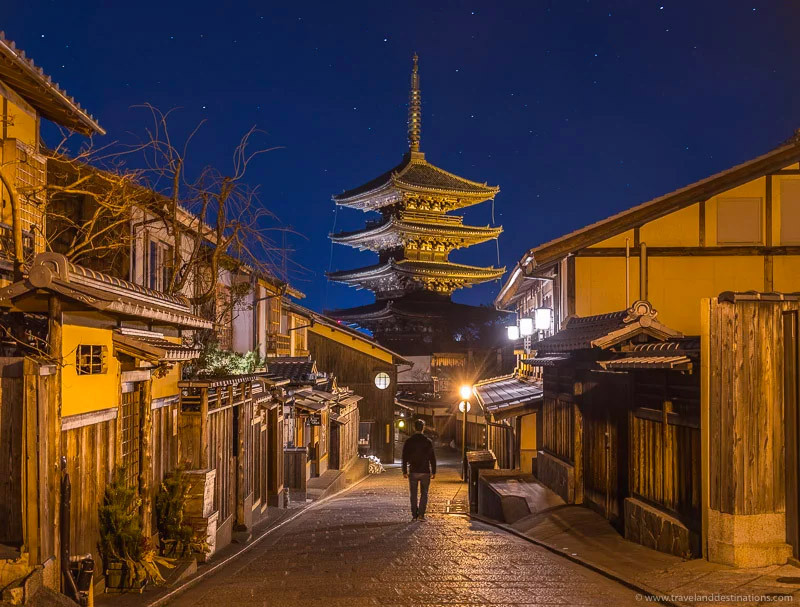 Here is the website link: https://www.travelanddestinations.com/in-pictures-japan-cities-at-night/. Thank you.